Are you inspired to conduct high-quality innovative research with a strong focus on mental and physical health? And do you aspire to work alongside world-renowned researchers who are absolute leaders in their field? In other words, do you want to become a leader in science? Join our research master Clinical and Psychosocial Epidemiology! Mental and physical health and the reciprocal relationship between these two form the basis of the programme. The central idea is that psychological, biological and social aspects all play a role in any physical or mental condition. The CPE programme trains students to solve current health issues by applying innovative research designs and statistical techniques while making use of state-of-the-art facilities in a truly multidisciplinary setting. There is a strong focus on prevention, diagnosis, and treatment of physical and mental health conditions, taking clinical, public health, and psychosocial factors into consideration. Our students work with existing large databases or collect their own data among people with or without a chronic disease, across the whole age range. There are four research departments involved within CPE: epidemiology, public health, health psychology and psychiatry. Top researchers from these four departments teach the courses, giving students the opportunity to fully acquaint themselves with different fields of research. In the second semester, students will get to choose in which department they would like to conduct their research for their master thesis project, becoming part of the department’s research group. Students will learn to design their own PhD project as part of the programme, which makes them well-qualified to attain a PhD position anywhere in the world. The best students will be offered the opportunity to continue with a PhD at the University Medical Center Groningen (UMCG). We pride ourselves on the fact that there is a lot of personal attention for our students. The programme is built in a way that strongly encourages students to focus on their individual development as a researcher, in a unique and multidisciplinary setting. Because CPE is a small-scale programme, every student is known by their name and has ample opportunity for interactions and discussions with the teaching staff. Our student landscape is just one more truly unique asset to the programme. This fully equipped space is dedicated to the master students of the Graduate School of Medical Sciences, in which they can gather, discuss projects, and study. Since it is located just across the hall from the Research Masters Office, students can easily drop by the office to ask any question they have about their programme. As of September 2019, the CPE programme will offer a new a track called CPE Track Health Systems and Prevention. This track bridges the research focus of CPE with that of health systems, health policy and prevention. The programme is a collaboration between the University Medical Center Groningen and the Aletta Jacobs School of Public Health. HSP Track students follow the basic CPE programme, but with a focus on health systems and prevention. This focus is mainly incorporated in the Master Thesis project, which for HSP students also includes an internship at a non-academic (Health) organization, the elective courses and the research meetings. 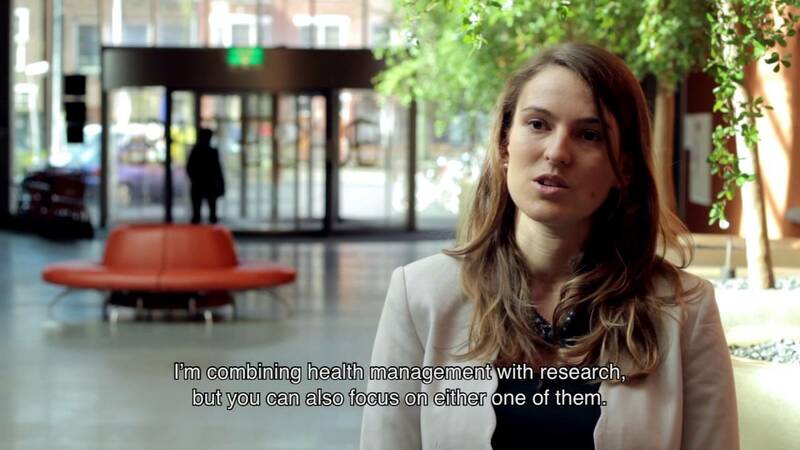 So, do you imagine yourself becoming part of our research community? Apply now! The first year starts with solidifying your basis in psychology, medicine, and epidemiology. Strong attention is also given to epidemiological research methods and statistics. To get an impression of the courses offered, go to https://www.rug.nl/ocasys/umcg/vak/showpos?opleiding=5140. Basics in Psychology and Psychosocial factors / Basics in Medicine. A minimum knowledge of 4 ECTS is required for both Basics in Medicine and Basics in Psychology. Depending on the background of the student the Faculty Board decides how the Basics course programme is set up for each individual student, guided by the advice of the Admission Board. The Master Thesis project is devoted to conducting a research project that will result in a Master Thesis. The research project must be embedded within the research institute of Health Research (SHARE) of the Graduate School of Medical Sciences (in specific in one of the four research lines 'Life course Epidemiology', 'Public Health Research', 'Health Psychology Research' or 'Interdisciplinary Center Psychopathology and Emotion Regulation') or a closely associated institute. The second year mainly consists of the master thesis project: data collection, data analyses and writing of the thesis. During the master thesis project, students choose some elective courses based on their area of interest, background knowledge, and the topic of their project within the departments of Public Health, Health Psychology, Epidemiology, or Psychiatry. Clinical and Psychosocial Epidemiology consists of both mandatory and elective courses. Depending on your knowledge, you will learn about the basics of medicine or the basics in psychology and psychosocial factors. Apart from broadening your knowledge in the field of health and the determinants of health, you will explore the fields of Public Health, Health Psychology, Community and Occupational Medicine, and Psychiatric Epidemiology. Strong attention is given to epidemiological research methods and statistics. You will be able to choose additional courses to suit your particular interests. Your individual development as a researcher is central to the programme and therefore you will be conducting research side by side with scientists who are leading experts in their field. Moreover, CPE is situated in the University Medical Center Groningen (UMCG), which means that you can benefit from a unique and interesting clinical setting and a unique availability of large data cohorts. During the second year you will write your master thesis, which can function as the basis of your own PhD proposal. High-ranking students will be offered a full scholarship to continue with a fully funded three-year PhD programme! An internship (abroad) is among the possibilities. Our international network stretches across Europe, and from Latin America to Asia! For enrollment, please note that you have to apply for the programme via Studielink. You can apply in Studielink starting October 10th 2018. Students with a Dutch degree should, after applying via Studielink, send an e-mail to cpe@umcg.nl for further instructions about the application procedure. Non-EU students may apply for a scholarship for CPE. The process of obtaining a scholarship is highly selective and non-EU students will need to indicate within their letter of motivation whether they depend on a scholarschip in order to be able to enroll in CPE or not. Make sure to motivate why we should select you for a scholarship. If you do not wish to continue as a researcher, there are plenty of other opportunities. Alumni currently work as consultants for the World Health Organization (WHO), policy officers in the government, consultants for pharmaceutical or biotechnological companies or as university teachers. For those students interested, you can choose to take courses to become a registered Epidemiologist A. You can find specific information about the epidemiologist training programme here. Clinical and Psychosocial Epidemiology is characterized by its problem-based research; our research groups focus on the diagnosis, prevention, treatment and prevention of mental health problems. As a student, you will study and work side by side with leading scientists. You will be considered a member of one of these cutting-edge research groups and in that way gather invaluable hands-on research experience. How do people function at work having survived cancer? What is the effectiveness of a family centred approach in preventive child health care? What is the impact of mental health on the school-to-work transition of young adults? Can mindfulness support people in dealing with chronic disease? How can patients learn to become more resilient (how can they break out of a negative mental loop)? Do patients and their partners experience less depressive symptoms when they are able to share their worries? How do partners deal with one of them having a chronic or life-threatening disease? “I think the best part of CPE is that you really feel what is like to be a researcher. You can dedicate a large percentage of your study time to your research project, allowing you to really focus on doing research. In a year’s time, you become an expert on your topic. Additionally, writing a PhD proposal is an integral part of this Master, making it much easier to continue your studies with a PhD. Research or business or government? The twenty-three-year-old student is also enrolled in a second master programme: Clinical Neuropsychology, which is focussed on the associations between the brain and neuropsychological functions like cognition, emotion and behaviour. ‘Dementia caused by Alzheimer’s disease is a terrible disease but unfortunately also common. My upcoming internship and thesis will focus on the relationship between Alzheimer’s dementia and disease insight. Are you highly motivated to become a top-researcher and learn all the scientific methods to get unbiased answers to your questions? Would you describe yourself as curious, critical and inquisitive? Are you an analytical thinker who is able to translate complex problems into 'to the point' and testable hypotheses and do you have an affinity with statistical analysis methods? Then the top rated research master Clinical and Psychosocial Epidemiology is just the programme for you! Each student is assigned to a mentor who is responsible for the evaluation of the student's progress, abilities, and limitations. The mentor and student have at least one scheduled meeting every three months.